These images are actually my second rendition of Vera Molnar’s “progressive” art style. Like many of Molnar’s pieces, I started off with a very simple geometric pattern. 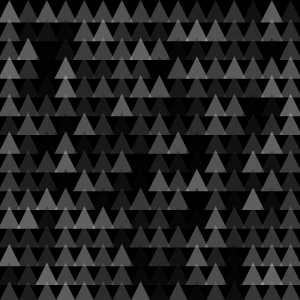 I chose triangles due to their modularity compared to rectangular shapes. As I am only allowed to change one variable at a time, I opted for a flat color scheme as I felt that it stayed more true to Molnar’s style of art. My first pictures consist of a grid of slightly overlapping triangles. 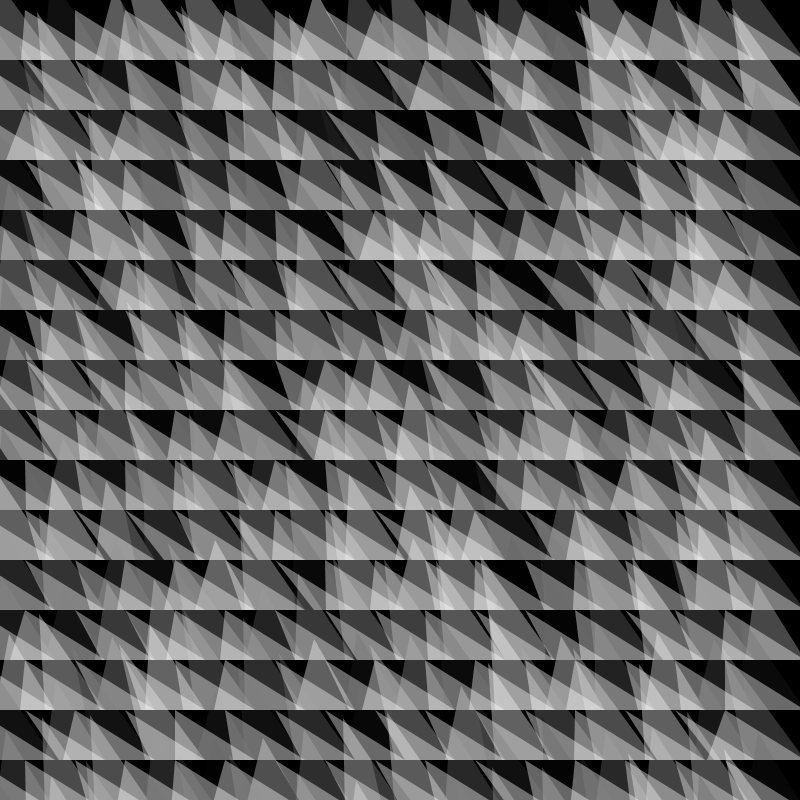 These triangles are opaque to create more texture as the overlapping areas result in a more complex pattern then a more traditional grid. 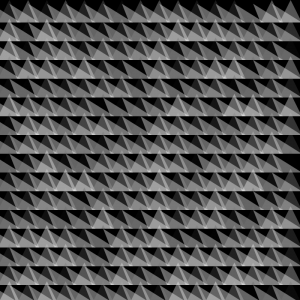 The code for this is fairly simple: a double for loop and some creativity in positioning the triangles. The first change I made was to randomize the color of the triangles. I chose to do this to break the super symmetrical and methodological pattern of the previous image while retaining its basic shape to make room for other modifications. 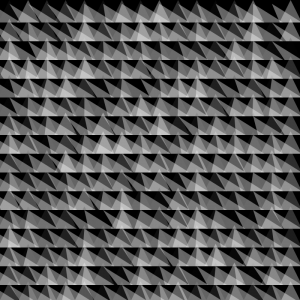 I feel like this also gives it more validation as an art piece, as it strays from the repetitive stigma of digital art by incorporating randomness, showing the effects. The second change I made was to lengthen the triangle on the underside (two triangles) that has retained its original color of white. This change I felt created a very unique pattern that to me, almost resembles sand dunes or some mountain ranges. I feel that this is successful due to the contrast of darker and lighter tones, similar to a how they are used in painting to create a sense of depth. The third change I made was to change the y coordinate of the “bright” triangle. Prior to making this step I had experimented with many variables, such as the color or opacity. However, I felt that this change created even more variation in the piece, yet still retaining the sense of depth that the previous image instilled. Now I feel that my piece is getting slightly crammed, showing how Molnar likes to experiment with more “open” pieces with empty space. Due to the tones in my piece it seems like the blacks become part of the image and add to the claustrophobic layout of the piece. My last change was to change the coordinates of the “shadow” triangle to break the evenness of the piece. I felt that this change did not bring the variation I was looking for, but due to being limited to changing only one parameter at a time I was limited by the simple objects I had chosen. Looking back, I should have changed the bottoms edges of the triangle to completely break apart the grid like structure. Digital art has always been seen as a “pseudo art”, where the creative process and the format has been looked down upon by “purists.” However, I feel that this type of gradualism in computer art allows us to see and understand the process of visualizing art through digital means. It allows us to see the step-by-step process of the creation of a art piece, and also leaves room for consideration in between unlike more traditional forms where you set off with a end goal in mind. I feel that this has greatly benefited me during the creative and is an invaluable part of the creation of. Another positive that I see is the freedom the digital platform provides. One can create a very complicated piece, not like something and immediately generate and apply the change! Overall, I think that the digital platform in creating art is a great resource and can aid future artists in fully utilizing their artistic capabilities.